The father of Communist Russia, Vladimir Ilych Lenin now seems to have emerged fully formed in the turbulent wake ofWorldWar I and the Russian Revolution. But Lenin’s character was in fact forged much earlier, over the course of years spent in exile, constantly on the move, and in disguise. 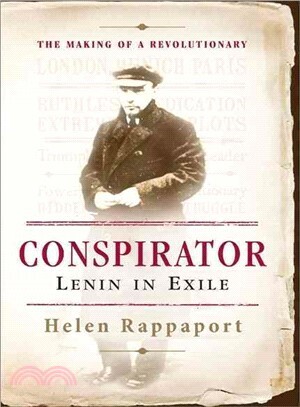 In Conspirator, Russian historian Helen Rappaport narrates the compelling story of Lenin’s life and political activities in the years leading up to the revolution. As he scuttled between the glittering capital cities of Europe—from London and Munich to Vienna and Prague—Lenin found support among fellow émigrés and revolutionaries in the underground movement. He came to lead a ring of conspirators, many of whom would give their lives in service to his schemes. A riveting account of Lenin’s little-known early life, Conspirator tracks in gripping detail the formation of one of the great revolutionaries of the twentieth century. Helen Rappaport is a specialist in Russian history, as well as fluent in Russian. In 2002, she was Russian consultant to the National Theater’s Tom Stoppard trilogy, The Coast of Utopia. She has translated all seven of Chekhov’s plays and is most recently the author of The Last Days of the Romanovs. She lives in Oxford, England.